Several months after filling Hearst Castle’s 345,000-gallon Neptune Pool with water for a music video shoot, Lady Gaga is instructing Californians to practice water conservation. Early this year, a leak prompted workers at Hearst Castle to drain the Neptune pool. Lady Gaga then demanded that the pool be refilled prior to her Feb. 11 music video shoot at the castle. She did so without the authorization of state parks officials. 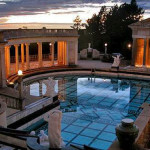 In exchange for shooting the music video with the pool full, Lady Gaga contributed more than $275,000 to the Hearst Castle Preservation Foundation. She also agreed to shoot a public service announcement for the state of California, which officials released Wednesday. The PSA directs viewers to saveourh2o.org, the state’s water conservation website. The release of the PSA came one day after the State Water Resources Control Board voted to create a stiff regulation on water wasting. The new rule will impose up to $500 a day fines on residents who wash their cars without a shutoff nozzle or who let landscaping water run off their property and onto public sidewalks or streets. Who gives a ratsA$$ about Lady Gaga. She made millions on her recording which she should not have been allowed to do but obviously has the right connections with the Hearst Family. Let it go, Lady Gaga, and go solve the problems in your Magic Kingdom of New York which is one step ahead of California for self-destruction. Go get that 64 oz soda, no salt on the tables and how about the 60% of cigarette sales are black market because of the tax and in the increase in crime since the police can no longer search for weapons. Solve your own problems and leave us to our own idiots! She should consider changing her name to,,, Lady Hypocrite. I can’t believe we are still chewing on this five months later. Everyone wants her held to a higher standard. She’s an entertainer, big whoop. How about the people that I pay, i.e. politicians etc, be held to a higher standard? That is a way bigger concern. Oh and fine L.G?? O.k. fine her $500.00 bucks. She contributed $275k. Again people are focused on the fact that there is a fire in the outhouse, meanwhile forgetting the main house is a raging inferno. And from the response, this is why CA. is going nowhere fast and we are in the mess we are in. For me personally, I would spend a little more time contemplating water conservation if the ad showed the out-of-work farm workers in the valley and was narrated by someone who really depends on water for their living, instead of some fake celebrity that feels she can do whatever she likes.